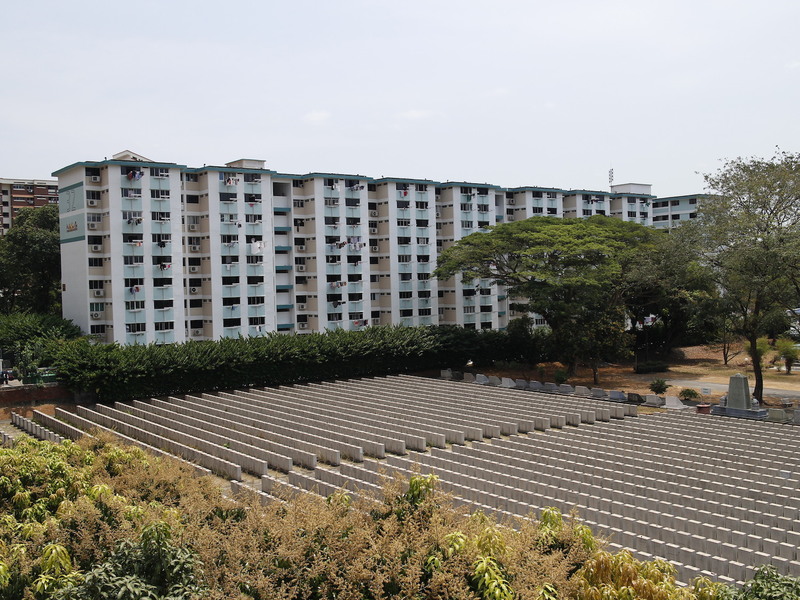 For many Singaporeans living in the west, a trip on the East-West line towards town is often filled with the dread given the distance and jostling for space on board. 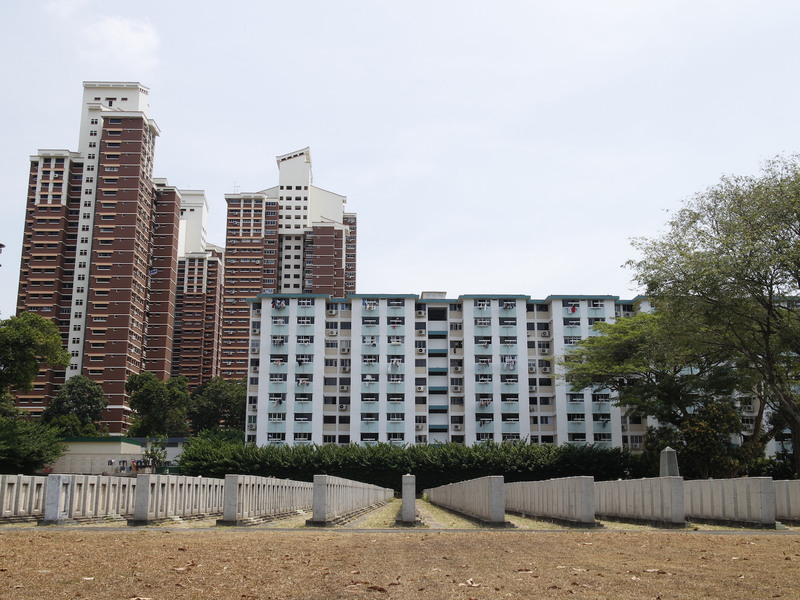 Yet in a pocket of space in-between Buona Vista and Commonwealth stations, there lies a little oasis of solace if one takes a look out to view the nearly 3000 neatly aligned graves amongst the many high-rise apartments of Holland Close. 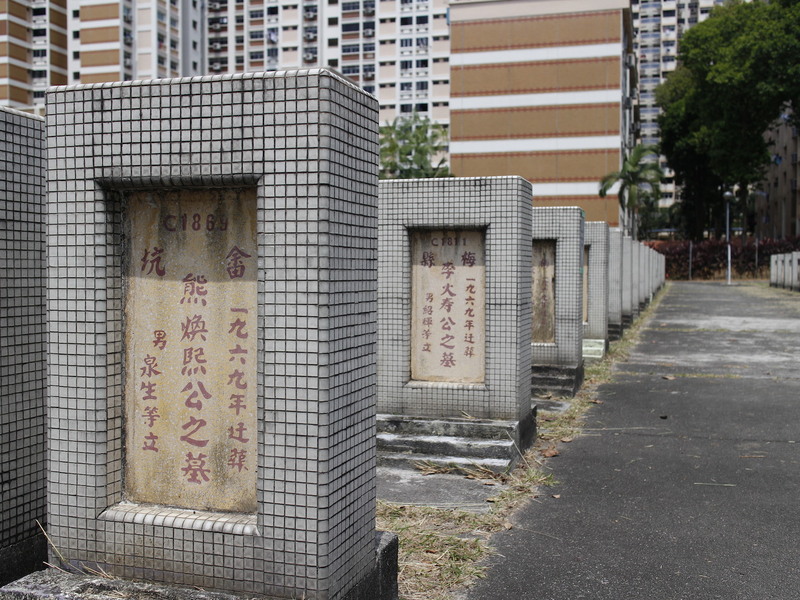 Built in 1969, this is the Ying Fo Fui Kun(应和会馆) Cemetery, better known as the Hakka Cemetery. 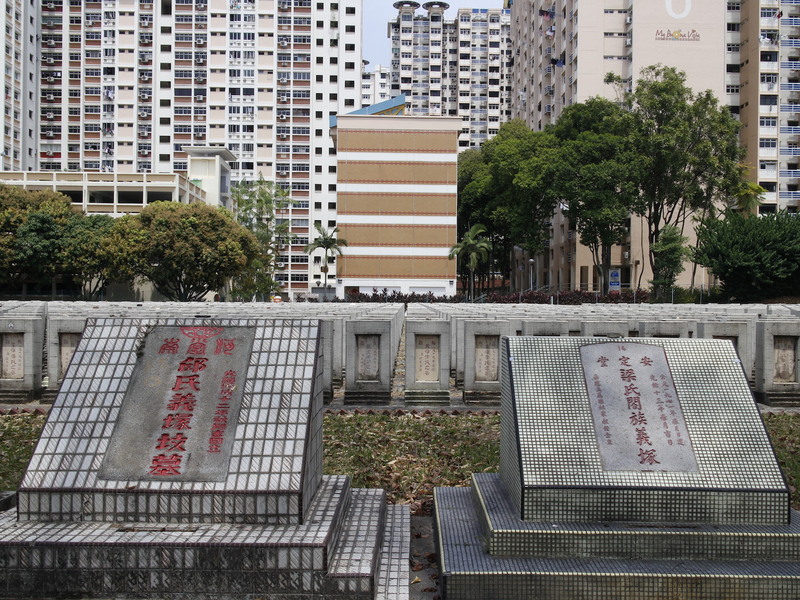 The beginnings of the Hakka Cemetery trace back to 1822, when the first influx of migrants from the Guandong province setup the Ying Fo Fui Kun clan at Telok Ayer street. A minority group in comparison to the Hokkiens and Teochews, the carefully chosen words of “应和” or Ying Fo/Ho reflected their desire for a peaceful environment and mutual support amongst fellow migrants. 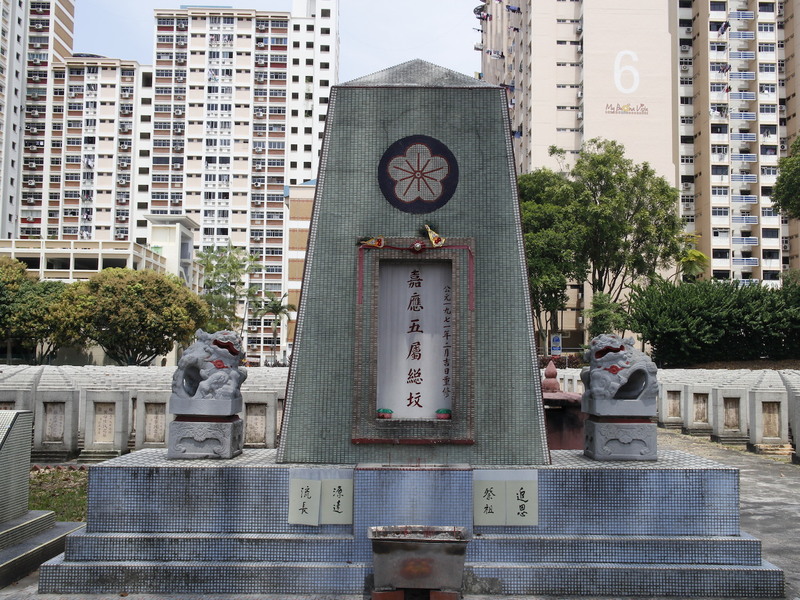 In 1887, the Ying Fo Fui Kun clan bought over 100 hectares of land between the current Buona Vista and Commonwealth areas and named it Shuang Long Shan (双龙山) or Double Dragon Hill. 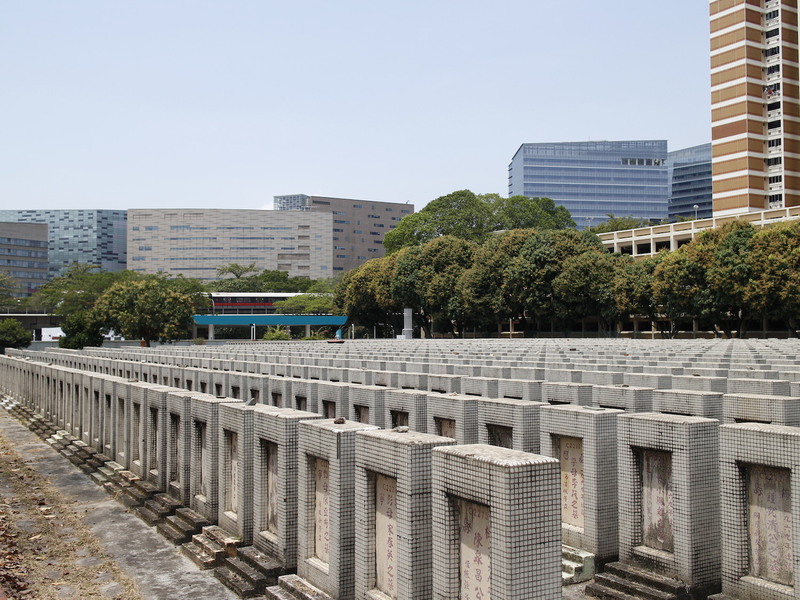 The area was to be used as both a village and burial ground and was also chosen because the Chinese often saw the building of cemeteries on top of hills as being highly auspicious. A cyclist on his way through the cemetery. 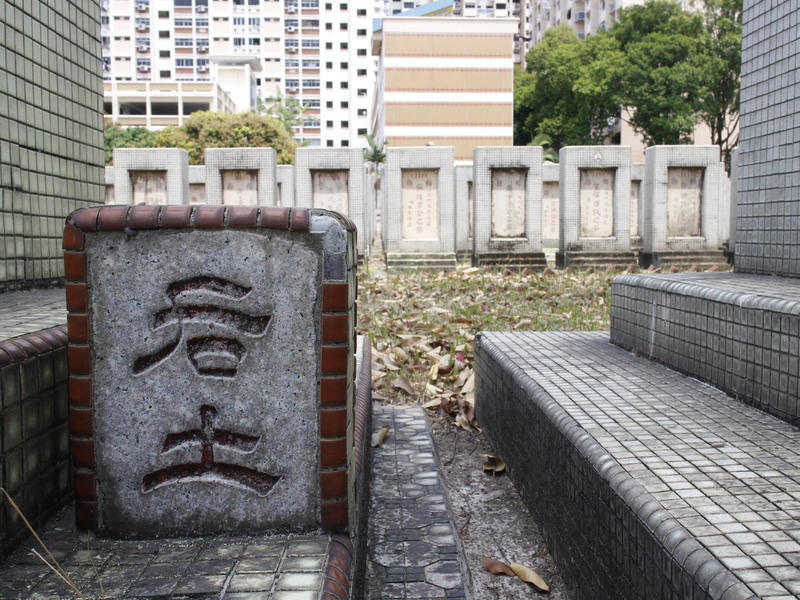 Also present is the symbol of a stone lion, a common protector of Chinese graves. 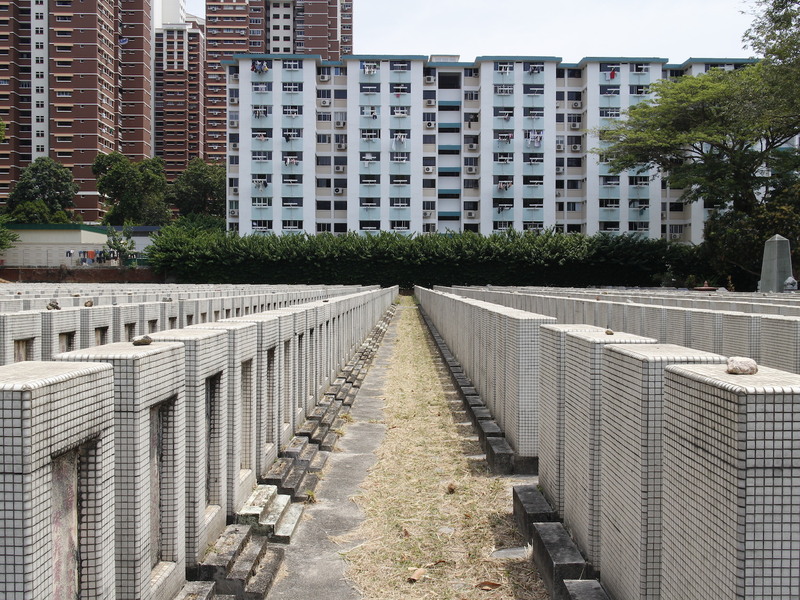 There’s a wonderful symmetry between the tombs and high-rise apartments, something that the HDB designers may have considered when they designed the cemetery in 1969. 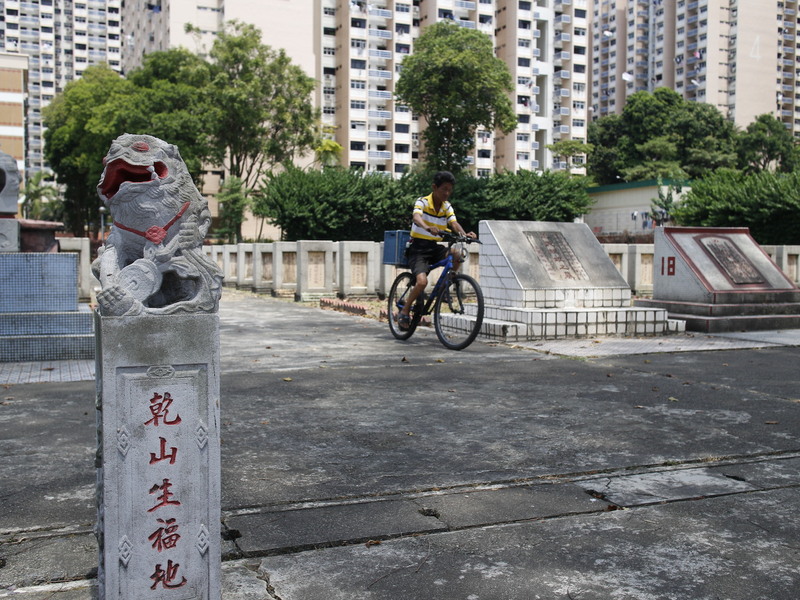 Despite being met with constant resistance from the Colonial Government in the 1930s, it was not up till Singapore’s independence in 1965 did negotiations between the clan and state began to fully reclaim the area of Shuang Long Shan for urban redevelopment. 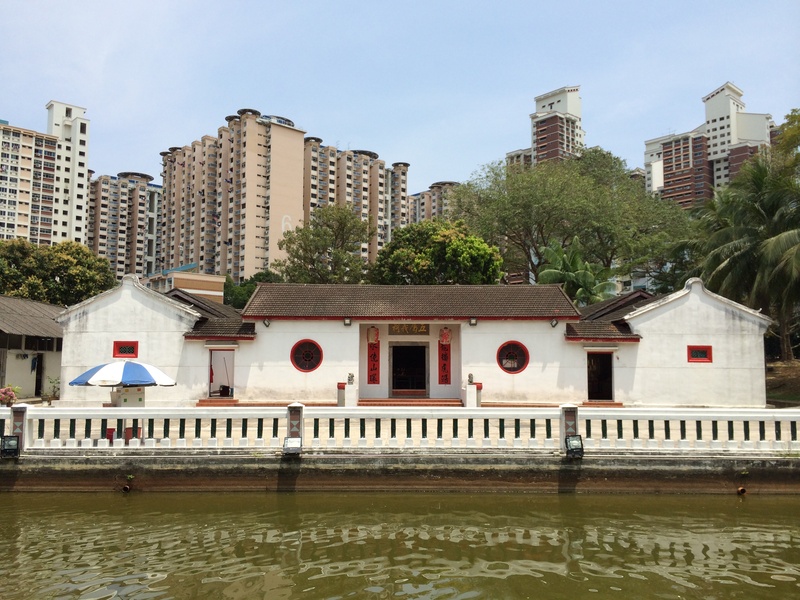 In 1969, all but 1.89 hectares of the land was returned to the state, and a 99-year lease was placed on the area where the current graves and ancestral halls of Shuang Long Shan Memorial Hall (双龙山念堂) and Wu Fu Tang Ancestral Hall (五富堂义祠) now stand. Stones are often placed on top of the tombs as an indication of a visit. 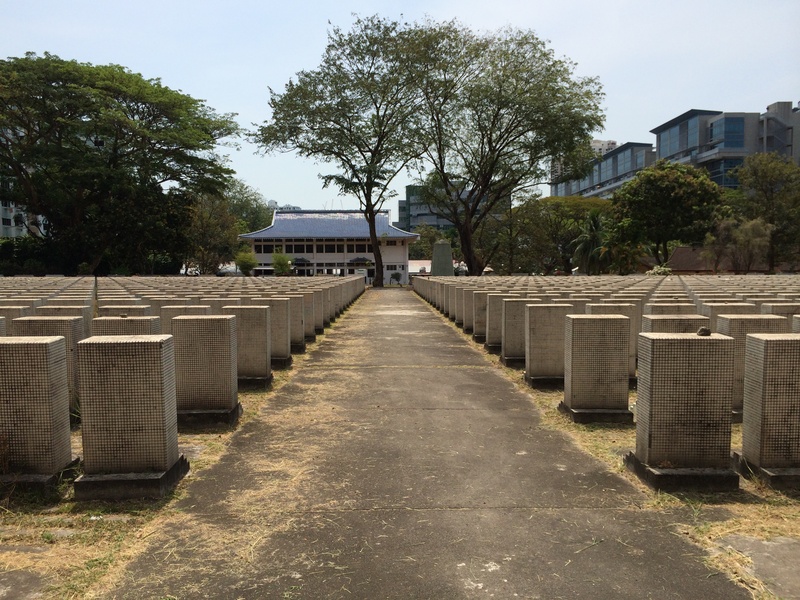 With the exception of 12 coffins, all other bodies were exhumed and cremated into urns that are buried under the nearly 3000 graves. 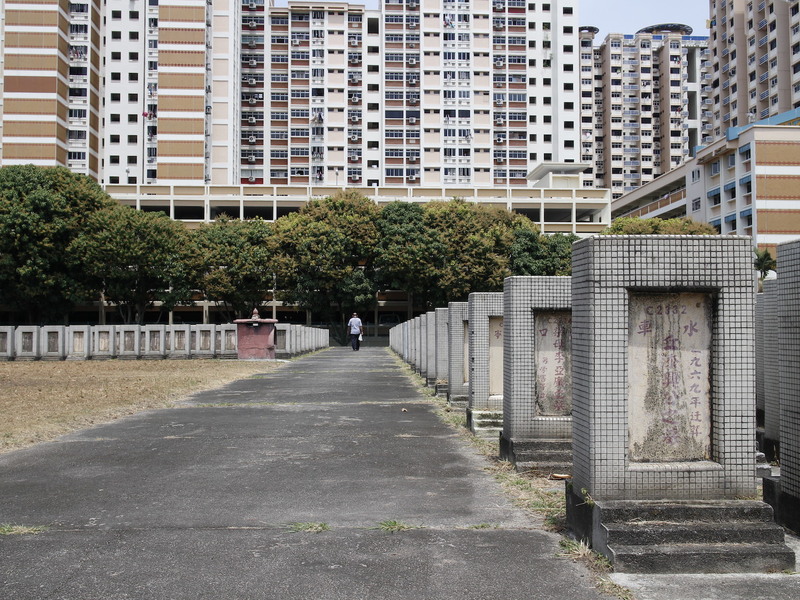 Interestingly, the Housing Development Board was behind the design of the cemetery with its uniformed rows and identically simplistic tombstones, a distinct deviation from the large bold engravings often associated with Chinese graves. Inscribed on the tombs are indications of the dates when the graves were moved to the current site. Most of which date to 1969. Though it’s often deemed inauspicious to stay near a cemetery, it seems that the many residents of Holland Close don’t seem to mind living near the dead, with many even using it as a shortcut to and fro to the Commonwealth train station. The 99-year lease of the land is far from up, but talks and plans have already begun to consider making way for redevelopment within the next few years. Perhaps then it’s time for the dead to move again?